* 4.7 mm ( 0.19" ) LCD, 6 digits. * " - " for minus sign. * " mm " for mm measuring unit. 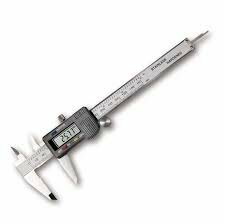 *" IN " for inch measuring unit. 0 to 150 mm ( 0 to 6 inch ). Inch & mm, changed by pushing the button, true conversion. Zero setting at any position within the measuring range. Automatic switching, '-' indicates negative polarity. One battery, 1.5V, silver oxide. Approx. DC 18 uA. Battery approx. Approx. 5000 hours for continuous use. Serial output for computer interface & printer. Instruction Manual ......................................1 PC. Carrying case...............................................1 PC. Battery ( 1.5 V, silver oxide )........................2 PCs.